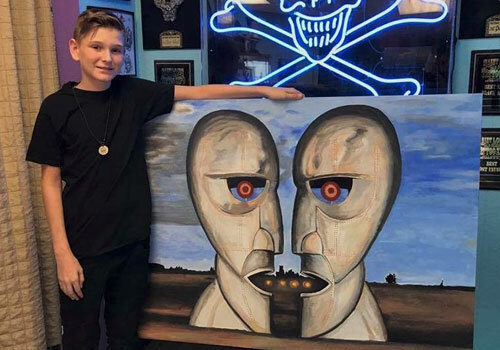 Isaiah Sizemore is only 14, but is already an award winning artist. He has won multiple awards including 7 awards with Art Sonia. He was just on abc news the “morning blend” promoting his paintings that will Be done live on October 27th, 2016 on blooddistrict.com. He does paintings big and small, he does some mural work with his father & some tattooing with his father. Isaiah won a scholarship from palm harbor middle to become a member of the Dunedin fine art squad. He’s done many tattoo shows with his Dad. Isaiah is available for freelance work including murals and acrylic paintings. He is currently a Tattoo Apprentice.